As the nights draw in and the hedgerows are bright with the colours of autumn, the garden enters a new, slower phase of life. Plant growth becomes more gradual and we have time to reflect on the past year and make plans for 2019. This year has been one of extremes – snow in spring followed by intense heat and drought. Not an easy year for growing vegetables and I know it’s led many UK growers to think more about climate change, extreme weather events, and what that means for their businesses. Here at Trill, we address the problem by creating diversity in the garden. Diversity in the crops we grow, diversity in our fertility-building green manures and diversity in the seeds we sow. We grow more than 60 different vegetable crops over the course of the year, over 125 different varieties and have 8 different plant species in our green manures (most growers only use 1 or 2). All this means that we can offer a diversity of vegetables to feed our customers, a diversity of plants to feed our soil and what’s more, whatever the weather, something will grow well! ​Our dedication to diversity also stretches to the seeds that we save and sow. The dry, warm summer was perfect for seed production and we harvested enormous seed crops of Golden chard and a parsnip called ‘Tender and True’ for The Real Seed Catalogue in Wales. Both these varieties are genetically diverse, open pollinated plants which ‘breed true’. This means that we can grow a number of plants of a variety, allow them to cross pollinate and we end up with offspring which are similar (but not identical) to the parent plants. Importantly, cross pollination maintains the genetic diversity in these varieties, ensuring that the crop has the means to adapt to future growing conditions. In the case of our Golden chard, this genetic variation is clear – the stems come in every shade of yellow from buttercup to mustard. With our ‘Tender and True’ parsnips, the differences are much more subtle, perhaps one is more resistant to canker, another might be more tolerant of drought. Our chard and parsnip seed crops are just two of many crops we save seed from. All in all, we have around 40 varieties of 20 different crops in our seed stock which we have grown ourselves. 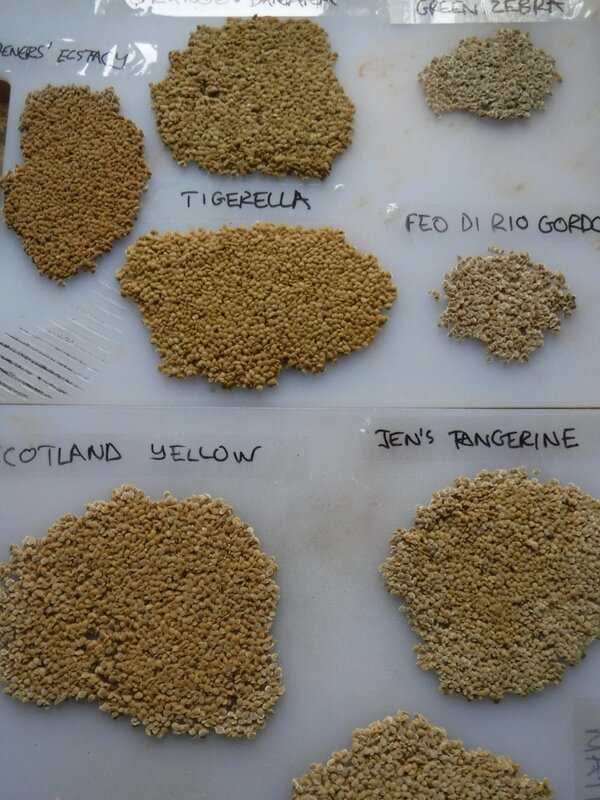 ​Before we save seed from a particular crop, we always choose the best examples of that variety to use for seed production. That way, each year we save seed, we’re choosing the plants that are best adapted to our growing conditions, our soil and our micro-climate. Eventually, we’ll end up with plants that are specifically adapted to our site. This process can take a little patience – biennial crops take 2 seasons before they flower and set seed - but experience shows that the quality of our homegrown seed outperforms the seed that we buy in, and so we continue. October marks the beginning of change in the garden, as summer makes way for autumn. 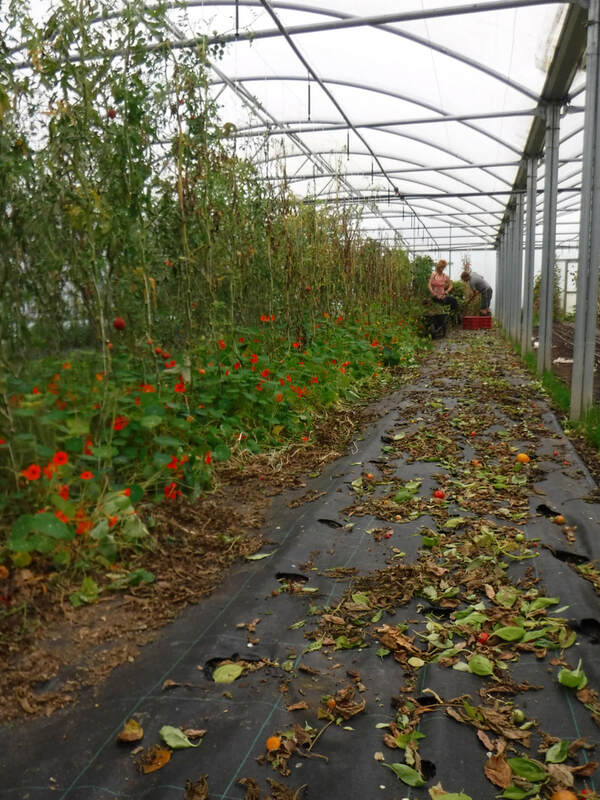 The polytunnels are cleared of their summer crops; tomatoes, beans, cucumbers, peppers and chillies being cleared for winter salad leaves, herbs and a few early spring crops such as spring onions, sugarsnap peas and early garlic. Meanwhile, outside the summer crops have also faded with the courgette and french beans plants slumping back into the soil from which they came, the runner beans still just about standing but not producing much, and the squash and sweetcorn all harvested. ​Preparing the polytunnels for planting our winter/spring crops is usually a case of clearing the old crops by cutting back the plants at ground level, leaving the roots in situ to provide food for the life in the soil and also help with drainage as they leave channels in the soil once they break down. Normally the beds are then soaked thoroughly for a day and then raked. This takes off any lumps of compost that hasn't broken down in the summer and breaks up other lumps of soil to create a fine tilth for planting into and minimises hiding places for slugs and snails. Depending on what crop has been growing there is normally enough fertility from the compost that was spread in the spring, so the beds are not usually mulched again before planting the winter crops. Once planted, the beds are given another thorough soaking from the overhead sprinklers to help the plants get settled in. Then we usually water with drip irrigation to minimise slugs. ​Outside is dealt with quite differently. It all depends on how wet the ground is in October as to how we manage the soil over winter. Ideally the ground will be dry enough to cultivate lightly before sowing overwintering green manures, usually consisting of cereals such as rye, oats or even wheat and maybe some vetch. This is easily done on beds that have been covered in mypex through the summer and are relatively weed free. Here we can remove the mypex, folding it up neatly and labelling it for next year and let any weeds germinate before hoeing off and direct sowing the green manures in rows about 10-15cm apart to allow inter-row hoeing. The overwintered cereals are very good at holding onto nutrients over winter and reducing soil erosion and leaching caused by the winter weather. Preparing ground for early plantings in the spring usually means covering with silage plastic, held down with sand bags. Again, depending on the preceding crop and how much compost has been applied we may spread some compost before covering with the silage plastic. This protects the soil over winter, minimising leaching of nutrients from the winter rains, but also kills off any crop residues and weeds. Then in the spring, the beds are weed free and almost ready to be planted. The plastic keeps the soil quite dry so that we can cultivate early in the spring if we need to – normally just reforming them with the bedformer. If other areas are too weedy to create a good seed bed and do not need to be planted early in the spring then we tend to leave them weedy to cover the soil overwinter. Many weeds act as well as any other green manures overwinter – their roots protecting the soil structure and maintaining biological activity in the soil. These beds can then be dealt with later in the spring once it has dried enough to get the tractor on to cultivate. We always grow parsley in the tunnel, just for superior quality and fast regrowth – much like we do with most of our soft herbs – coriander, chervil and basil mainly. We aim to have parsley all year, though there can sometimes be a bit of a gap around end of April to end of May depending on how early we have planted the February sowing. We only do two sowings, one in early-mid February and one in early-mid August. The first sowing we plant into the tunnels around early April and harvest through the summer and autumn. We usually leave some of this in all through the year and over winter, but aim to have the second sowing planted in September so that it gets well established and can be harvested through winter and spring. The February sowing usually goes to seed just a bit earlier than the August sowing. We have always used Italian Giant, which we have saved seed from for the past 4 or so years. We save seed each year – making sure it is not from plants that go to seed early, to ensure that we always have fresh seed to sow, as it does not keep particularly long. We found huge improvements from sowing from our own saved seed for parsley, and there is the added benefit of allowing it to flower, which as an umbellifer attracts huge amounts of beneficial insects. We sow two to three seed per module in West Riding compost, cover the seed with a sprinkling of vermiculite, then soak the trays from the bottom. These are then covered in polystyrene for about 10 days, so that the seed can take in enough water and then the polystyrene is taken off to allow light to get to the trays. We have started growing some curly leaf parsley too, as some restaurants prefer this as it tends to have a stronger flavour, and so they need less of it. When harvesting parsley we cut the plants right down, a few inches above the soil surface, we weed as we harvest and remove any older leaves from around the plants too. ​The only problems that we have ever had is some mildew if the soil is not moist enough, but the plants always seem to grow out of this come spring when they grow rapidly again. Having grown for seven seasons we are feeling much more in control of the growing side of the business at Trill Farm Garden. Winter is naturally a time of reflection, so we look at how the year has gone and whether there are changes to be made for the next year. As the years go by there are fewer and fewer changes to be made as we refine our cropping plan based on what has sold well the previous year, what grows well on our soil and what makes us a living from our small area of land that we work. As we have built up our business it has allowed us to take on more labour, mainly people who have come wwoofing at the farm, then became friends and then continued to work for us as paid labour. We have also had an informal trainee for the past three years. We are really lucky to have had such a great team of friends working with us who are interested in vegetable growing. A significant benefit that small scale family farms offer over larger scale farms is the labour requirements needed to run them. This means that where the average farm employs 0.017 people per hectare, small farms employ 0.72 people per hectare. One of the autumn projects this year has been to tidy up some of the spaces around the polytunnels by making beds for growing cut flowers for our summer stall in Lyme Regis, and for growing raspberries (mainly for ourselves...). We have been using offcuts from the sawmilling that is done at Trill to edge the beds, to stop the weeds from creeping in at the edges, and making use of the woodchip which has been produced from clearing around the power line that goes through the farm. We are still processing seed that we saved through the year – some for ourselves, and other grower friends, and some for the Real Seed Catalogue. 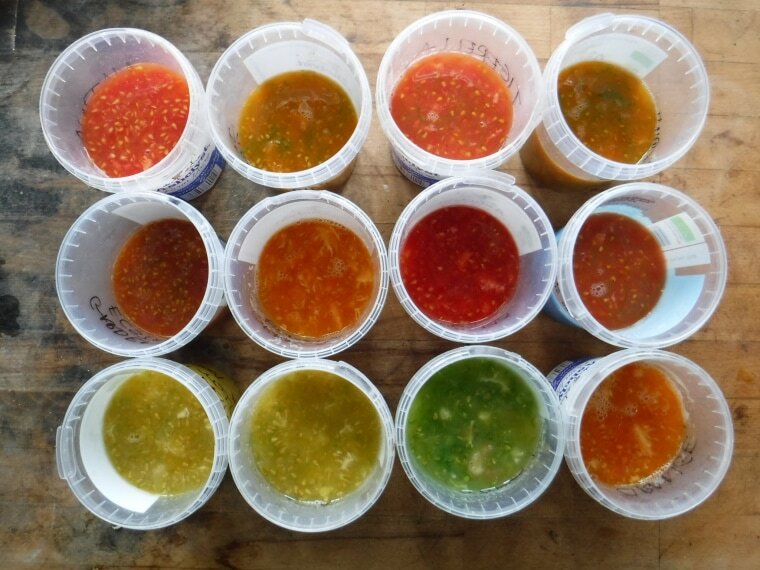 We have huge amounts of orache and salad burnet for our summer salad mix, lots of beans and tomatoes, and our first biennial seed crop from a beetroot called Avon Early which I got through the Heritage Seed Library. 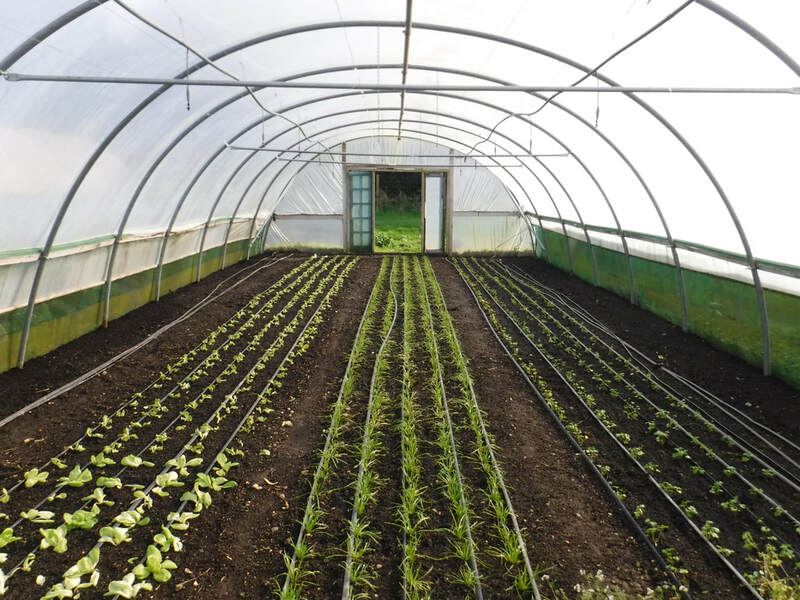 We have grown chillies, sunflowers and poppies for the seed catalogue, and have turnips growing in the tunnel which we will save seed from next summer. One of the best and easiest successes from seed saving this year was the strip of coriander that we kept in at the edge of one of our polytunnels. We were able to save a huge amount of seed very easily, but before that the coriander flowered and was host to a great diversity of insects including many parasitic wasps which in turn predated on the aphids in the polytunnel. Allowing plants to flower like this often attracts many beneficial insects, many of which often eat the crop pests. Helping to create this balance is a fundamental organic principle and doing so whilst also producing a crop of seeds is ideal. Select strong healthy plants with characteristics that you are looking for. 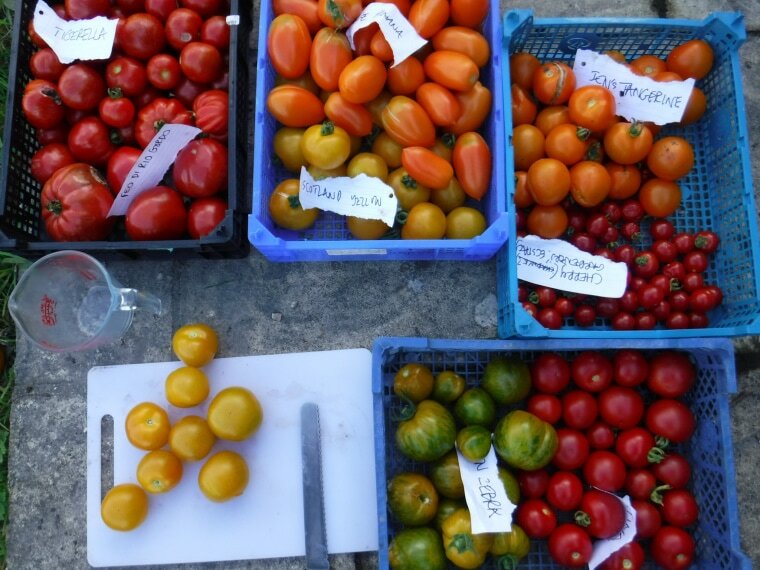 If it is an heirloom variety that you are saving, it is best to select the variety that best fits the description of the variety. If you want to select varieties that fruit earliest, then select the earliest fruiting each year. ​Clearly label the plants that you have selected. Tomato plants generally do not cross with one another (they are in-breeders) so you can grow and save seed from more than one variety in one polytunnel. ​Once the fruit is over-ripe for eating it will be ready for harvesting for seed. At this stage take all the ripe fruit off the plants, then slice them along their equator (use a bread knife for this as it is less likely to damage the seed). Then squeeze out the pulp into a container. ​This can then be left for 3-4 days to ferment (this breaks down the germination-inhibitor that surrounds the seed). Do not leave for longer than for days as premature germination can occur. You may notice a mould appearing at the top of the pulp – this is fine and all part of the fermenting process. Once fermentation is completed then poor the pulp/seed into a long necked container – something like a milk bottle works well. Fill it up to ¾ full and shake the bottle vigorously (with a lid on…). This helps to separate the seed from the pulp. As the seed starts to settle back down to the bottom of the bottle you can start to decant the pulp and water. A few small, light seeds may also come out. Decant until most of the water has left the bottle then repeat this process 5 or 6 times, or until the seed looks clean. Fill up the bottle, now with clean seeds in, one last time and empty into a sieve. Blot the bottom of the sieve with kitchen towel to dry excess moisture and then turn out the seeds ideally onto a non-stick surface such as a plastic chopping board. Using the bottom of the sieve, spread out the seeds evenly to form one layer of seeds. As you are doing this you can have a bit of kitchen towel inside the sieve which will take away some of the moisture without the seeds sticking to the towel. ​Label the seeds and put somewhere dry and airy to dry further. Once the seeds have dried they will peel off the chopping board in one piece. They can then be crumbled up into a paper seed packet and dried further using silica gel. To do this put the seed packet inside an airtight container and put the same amount of silica gel in the bottom of the container. Put a humidity reader into the container and close the lid. Leave until the relative humidity is around 50%. Then remove the silica gel and store the seeds in the airtight container somewhere cool and dry, and they should keep for up to 5 years. Don’t forget to clearly label the seed packet with the variety and the date. Ashley has been running Trill Farm Garden since 2010 with his partner Kate. Ellen is the Senior Grower and Seed Coordinator at Trill Farm Garden.